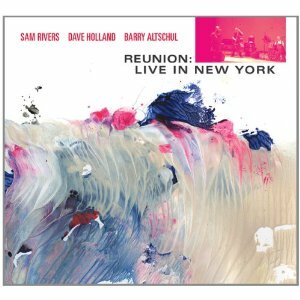 Lets get right down to it: Reunion: Live in New York, the new album on Pi Recordings, from Sam Rivers, Dave Holland and drummer Barry Altschul is an album that you absolutely need to check out. Recorded May 25, 2007 at Columbia University during WKCR radio’s week long tribute to Rivers, this stunning two disc CD is fully improvised, with each disc containing one continuous set. The album is a sterling example of the possibilities of freely improvised music and a strong contender for album of the year (it’s going on my best of 2012 list as soon as I post this review). Listening to this album, which will be released on September 25, you’d never know that this trio hadn’t played together in over two decades. This trio is one of the many manifestations of Rivers’ Studio Rivbea, a fixture of the New York City Loft Scene in the 70s. The group played regularly together from 1972 to ’78 and during this time they rehearsed for hours on end, which can be heard in this group’s incredible hookup. The music ebbs and flows, morphing and transforming effortlessly – nothing is forced; changes in direction, texture, and atmosphere are allowed to unfold as they should. Driving and winding post-bop lines from Rivers’ tenor or flute underscored by Holland’s charging walking bass and Altschul’s light brushwork, out of time call and response flourishes, tight little grooves that appear out of nothing, impressionistic forays via Rivers’ piano which evolve into playful ramblings – it’s all here – all created organically. This is the height of free playing. It’s a shame these guys weren’t recorded together more often, but Reunion: Live in New York does more than rectify that problem – it documents in tangible form perhaps one of the finest, and certainly one of the tightest, small groups of the last four decades. Note: check out Darcy James Argue’s review of the concert here. He also took several excellent photos – I’d share them, but I didn’t ask for his permission. Nate Chinen also wrote a fine review of the show for the NY Times. Edit/Review Update: somehow I neglected to mention that one of the disc’s highlights is Rivers’ flute solo at the beginning of Part Two of the second disc on which he hums through his flute and then alternates sung melodies with flute ones – this call and response is quite compelling.